Arthur had a “ruff” start at life: being passed from one owner to the next several times, having an unfortunate mishap with a horse along the way, and not receiving the proper vet care. 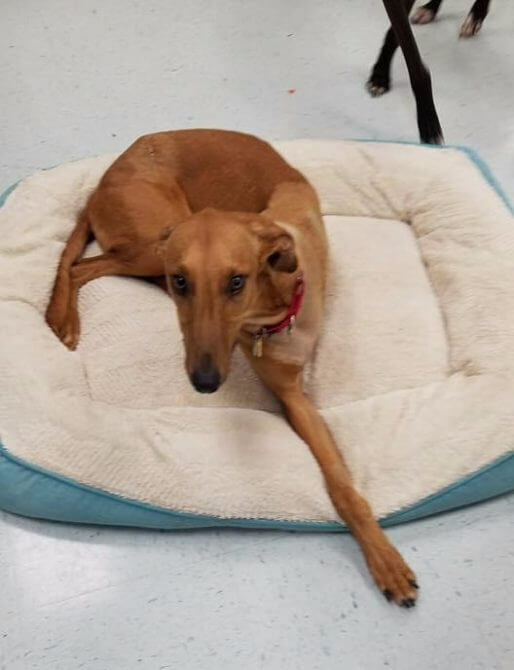 He was eventually handed off to the wonderful people of the Ohio Lurcher Program who saw to it that he received vet care for his injured leg which unfortunately had to be amputated. After a great deal of suffering with a mangled leg, Arthur was finally free from his past and is eagerly looking forward to his new future. After some time to heal Arthur came to me and my wife as a foster until his forever mom was ready for him, and in this time we quickly learned that this dog is not disabled by any means. Never once had he allowed his loss to prevent him from doing everything any other dog would do. He loves to run and play with our two dogs, loves to snuggle, and enjoys his squeaky toys. He’s a sweet young man full of life, love, and kisses, with a heart bigger than himself and an absolute love for children. So if you ever get the honor of meeting this gentle boy don’t pity him, that’s not what he wants, rather a few ear rubs and hug would do.